Safety is the first priority for Africa VIP Travel. Our director and head guide, Kambona Mollel, has been climbing Kilimanjaro for over 15 years and has certified expertise when it comes to safe climbing and client success to the summit. He is a Wilderness First Responder certified by Wilderness Medical Associates. Since 1999, Kambona has updated his Wilderness First Responder certification with more than 250 hours of wilderness medical training and mountaineering courses. He has taught and instilled these skills and knowledge in all those who guide for Africa Vip Travel. Our guides’ primary responsibility on Kilimanjaro is the safety of all our clients and crew. Our special expertise is leading expeditions up Kilimanjaro, the tallest mountain in Africa. Our treks are designed to meet your hiking interests and skill level. We can take photographers to dramatic landscapes. We can take our time exploring the natural history of each eco-zone as we move through it. Our guides use longer, less traveled routes to the summit, which adds to our clients’ safety, enjoyment and success of the climb. No one knows the mountain better than we do, and no one offers you a better mountain experience. In addition, on all our Africa VIP Travel trips we include elements of cultural immersion to provide you with a deeper understanding of the people and places of Tanzania. Each trip we lead begins with overnights in Arusha, on the slopes of Mount Meru. Our hope is that we attract those guests who want to explore the rare beauty of our extraordinary country, and who are open to the magic of the people, the land, and the animals. Visitors come from far away to visit Tanzania, and we are dedicated to giving them an experience that will be fondly remembered long after they return home. Africa VIP Travel set out to transform the way things work on Kilimanjaro. Too often, porters have been hired at the gate, asked to carry very heavy loads and given inadequate food, clothing and gear. We were the first company to make our porters a valued part of our business — relying on them to add a cultural and human dimension to our climbs. We hire only those we know and train, and we pay appropriate salaries a well as being attentive to our porters needs. When our porters experience our respect for them, they bring that same caring forward to you. The major health risk people face when climbing Kilimanjaro or other high mountains is a condition called Acute Mountain Sickness (AMS). If AMS is not treated in a timely and skilled manner, it can lead to more serious conditions like High Altitude Pulmonary Edema (HAPE) and/or High Altitude Cerebral Edema (HACE). Each year a very small number of climbers die on Kilimanjaro. These deaths could have been avoided if all licensed guides had high altitude medical training and carried oxygen and a portable hyperbaric bag, as we do at Africa VIP Travel do. Sadly, this is not the case for most of the over 2000 “guides” on the mountain. There are no minimum safety requirements set by the Kilimanjaro National Park Authority for companies climbing Kilimanjaro, so very few guides have proper health training. 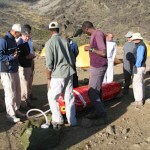 To ensure that all Africa VIP Travel guides have proper safety training, all guide team members are required to update their Wilderness First Responder (WFR) course taught by high altitude experts of Aerie Backcountry Medicine (www.aeriemed.com). The Wilderness Medical Associates WFR course has become the gold-standard of medical training for outdoor educators, expedition medics and guide companies working in remote regions of the world. The emphasis on the understanding of body systems and medical principles is designed to give certified guides the skills and confidence to adapt and respond to medical problems anywhere from the open ocean to the high mountains. Wilderness First Responder is the best basic medical training for people working and traveling off the beaten path. For all of our Mt. 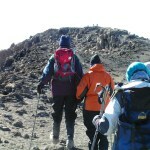 Kili climbs we carry safety equipment: oxygen, the Gamow bag, appropriate medication and cell phone. The Gamow bag is a portable hyper-baric chamber that is used in advanced acute mountain sickness with either HACE — high altitude cerebral edema, or HAPE — high altitude pulmonary edema. The bag is a portable, inflatable, man-sized high altitude chamber that helps adjust the ambient pressure as if descending 3,000 feet in altitude. When the climber is placed in it, they experience air pressure at a lower altitude, thereby reducing the symptoms of AMS. An oxygen bottle and mask are also used for emergencies of AMS. 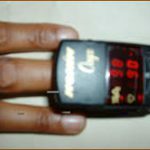 Our pulse-oxygen meter helps us monitor your response to treatment. When you climb with us, we always make surefinger meter you will be safe, comfortable, and have an enjoyable climb.